Well, unlike last year at this time when I was boasting and posting about the glorious bounty from my garden, this year has been slim pickin’s! However, so far it hasn’t been a total loss. 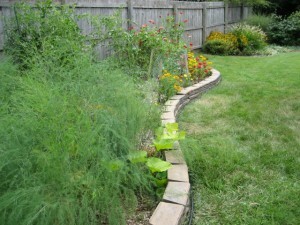 No ripe tomatoes yet – the fence and marigolds haven’t kept the rabbits and squirrels away – they must be really hungry and thirsty due to the high heat and dry conditions St. Louis has had this year. 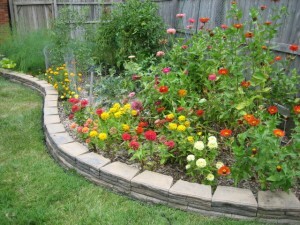 The rabbits have been munching the marigolds and the squirrels have been hopping the fence to grab the green tomatoes. 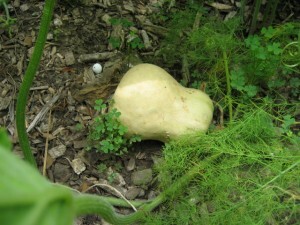 They even ate one of my baby butternut squash! 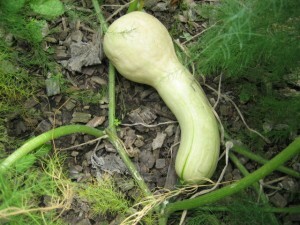 Last week I sprinkled some moth balls around and the squirrels have left the tomatoes and everything else alone so far. 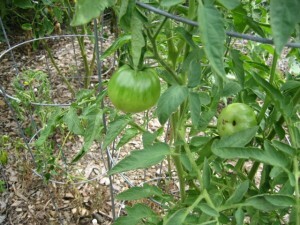 Hopefully I’ll get to sample a few of the heirlooms I planted this year. 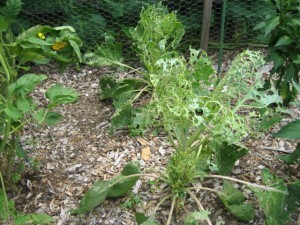 As you can see in the photos, the worms or caterpillars have helped themselves to the brocolli and brussels sprouts but they’re gone now so I left the plants in the ground in hopes that as the weather cools they may begin producing. 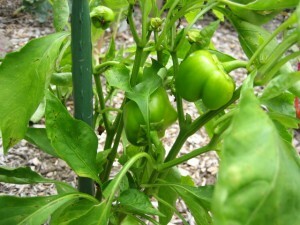 My purple bell pepper plant died and the yellow bell pepper has tiny green babies so maybe I’ll get a couple mature ones. 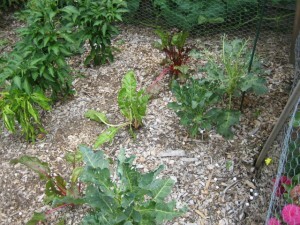 The asparagus has ferned out nicely and the Swiss chard is doing OK. 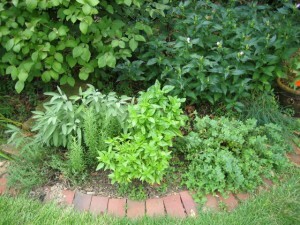 Most of the herbs are doing really well – lots of Thai and Italian basil, thyme, chives, oregano, rosemary and sage. The tarragon is all but dead. 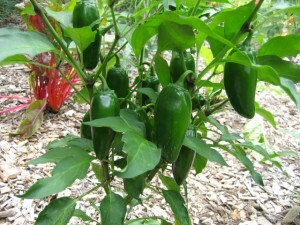 My jalapeno plants are doing great! 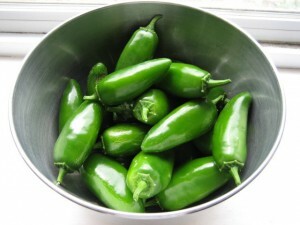 The fresh picked bowl full of them in the photo was made into candied jalepenos the other day. I hope those of you in the northern hemisphere are enjoying what’s left of summer!